Join Staff Assembly’s biggest raffle yet! Thanks to the generosity of our 2017 Thank Goodness for Staff Picnic vendors we are able to give away some great gifts, all in the name of helping students with food insecurity. Using ASUCD’s "Pay It Forward" campaign, which let’s you buy a slice of pizza from Ciao at the MU, for The Pantry in the form of a pizza ticket. The Pantry then distributes these tickets/free slices of pizza to any student that needs them. We are encouraging staff to buy a Pay It Forward slice(s) of pizza from MU’s Ciao. 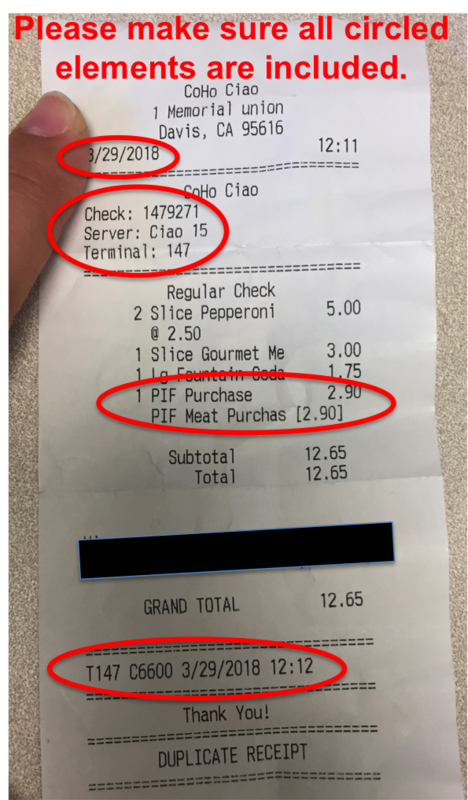 Send a photo of your receipt to Darolyn Striley via email (dstriley@ucdavis.edu), for every slice(s) you buy, between Monday, April 16 and Monday, April 30. You will then receive a raffle number for each slice bought. You have until May 1 to submit receipts to Darolyn Striley via email (dstriley@ucdavis.edu). Purchase a Pay It Forward slice, you can add it to your order or buy it on it's own, DON’T FORGET TO ASK FOR A RECEIPT! Take a photo of your receipt and make sure all of the receipt info is visible. We need specific information, but we don't need payment information (see example). Email the photo along with your name to Darolyn Striley, dstriley@ucdavis.edu, by MAY 1, 2018. When your email is received you will receive notification and your raffle numbers. CoHo Management will verify receipts for Staff Assembly. Staff Assembly will disqualify entries if they are deemed invalid by CoHo Management. You must be a UC Davis staff member to win, please email Darolyn Striley, dstriley@ucdavis.edu, for questions. Please save your receipt(s) until winner has been announced. We hope to provide The Pantry with hundreds of free slices of pizza for our students! Want to get involved in Staff Assembly? Come to one of our general monthly meetings, held on the fourth Tuesday of every month, from 12 - 1 p.m. in Plant and Environmental Sciences - Room 2005. Staff Assembly and its committees offer fantastic opportunities to develop one's skills and stay connected to the issues affecting the broader campus. We're a fun group and entirely focused on advocating for staff. Email Staff Assembly at staffvoice@ucdavis.edu for more information.